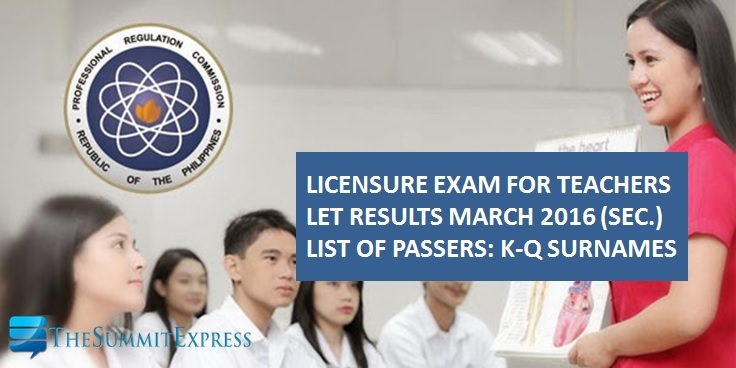 The Professional Regulation Commission (PRC) officially announced today, May 19, 2016 the complete results of teachers board exam conducted on March 20,2016 in several testing locations nationwide. View on this page the complete list of passers for LET-Secondary level. PRC named a total of 18,810 secondary teachers out of 53,090 examinees (35.43%) who have successfully passed the LET. The full list of passers for Secondary Level is now available online. Takers may now view on this page the alphabetical roll of passers for K to Q Surnames (Secondary).